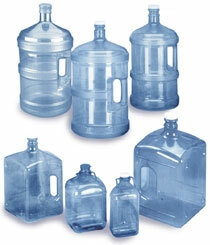 King Bottling provides bottled water of all sizes ranging from 8 oz. to a 2 1/2 gallon size to wholesalers, supermarket chains, convenience stores and distributors. Our equipment flexibility allows for distinct corporate branding and packaging. King Bottling employs unique just in time delivery systems to permit Electronic Data Interface (EDI) order processing, advance shipping notice and invoicing. King Bottling typically ships EDI ordered product within 24 hours of order receipt. King Bottling provides single serve case quantity water with customized labels to food services, convenience stores, corporate, business, school, fund raising and other private entities in lot sizes range from a few cases to full truckload quantities. King Bottling has the ability to design and print customized, full-color labels for single serve products ranging from 8 oz. to 20 oz bottles. Via co-packing arrangements, King Bottling bottles and packages single serve spring water on behalf of certain customers using customized label and packaging. These customers may provide all necessary packaging materials, and labels to King Bottling, and King Bottling converts these materials to finished product and may coordinate warehousing and/or transportation. King Bottling is capable of customer specific multi-sided labeling and packaging configurations. Bulk Returnable Sales – King Bottling bottles returnable 3 and 5 gallon units for customers in truckload quantity for delivery by the various distributors or franchisees. King Bottling is a licensed bottler for Aquablu Spring Water, JMJ Distributors, aWater4U, and Doyle Water Distributors all independent Office Delivery (HOD) businesses. We sell tanker loads of premium spring water. Whether you need 1 load per day, or if you need 30, we can supply your needs. We have the best tasting water that you will find. To see our source’s purity take a look at our analysis. The spring that averages 225,000 gallons of water per day. The water comes to the surface and cascades down a 19 foot high waterfall. If you need water for your bottling operation or for other processes, we can load it and transport it to your tank. Get Climax Spring Water delivered to your home or office now by calling 606-256-4142!